It is hard to go anywhere ON Fridays in Fountain Hills, Arizona without seeing red shirts everywhere. 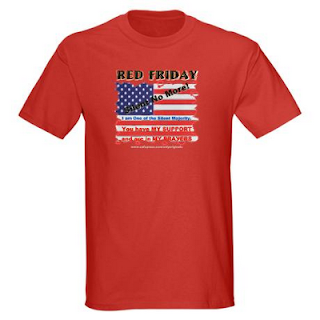 The VFW Post there introduced "Red Shirt Fridays" by selling red shirts to the community as a way to show support for our troops, as well as raise funds for veterans and their families. VFW Post 3401 in Morris Plains is now "Red Shirting" as it is being called when a post and community participate in the program. The red shirts have a eagles head over the heart, dog tags hanging down with POW on one and MIA on the other and on the back VETERANS OF FOREIGN WARS - HONORING OUR DEAD BY HELPING THE LIVING. This is a great way to ot only show our troops and their families that we support their service and sacrifice, but that we are also helping veterans. We hope to meet and see the many wonderful patriots in our community who will participate in the "Red Shirt Fridays" project. VFW Post 3401 members will be out in Morris Township / Morris Plains selling the shirts as well as at the many events that are held at the post itself. Let us all proclaim that every Friday will be Red Shirt Friday!